AWE Tuning Audi 3.0T ColdFront™ System. Designed in house at AWE Tuning, the ColdFront™ system line is the solution for consistent and reliable performance for modified vehicles looking for maximum power and security. When fully equipped, this system prevents losses of more than 23hp at the wheels after just a few WOT passes. Designed for maximum cooling capacity, by keeping you cool, your Audi's engine will make more power and make it more consistently. When you decide to add performance modifications to your Audi B8 S4/S5 it put more strain on your engine which means more heat is created. Extra heat then puts more strain onto your cooling system and in turn you begin to loss power. AWE Tuning realized this is the main Achilles Heel of the Audi S4/S5 drivetrain. It's no secret that heat soak is the enemy. Particularly when dealing with forced induction. During initial development testing of their ColdFront™ Heat Exchanger and ColdFront™ Reservoir, AWE found that with repeated full-throttle runs, the heat buildup in the heat exchanger cooling system overwhelmed the thermal reserve capacity of the stock coolant pump, driving Intake Air Temperature readings through the roof. As IATs rise, power decreases, in our case, to the tune of -23 WHP @ 6900 RPM after 8 consecutive full-throttle runs on the dyno. Much like with the human body, when you want to supply more oxygen, you need to move more blood. To move more blood you need a bigger heart, right? And so, that's precisely what AWE has done with the addition of the optional ColdFront Coolant Pump. 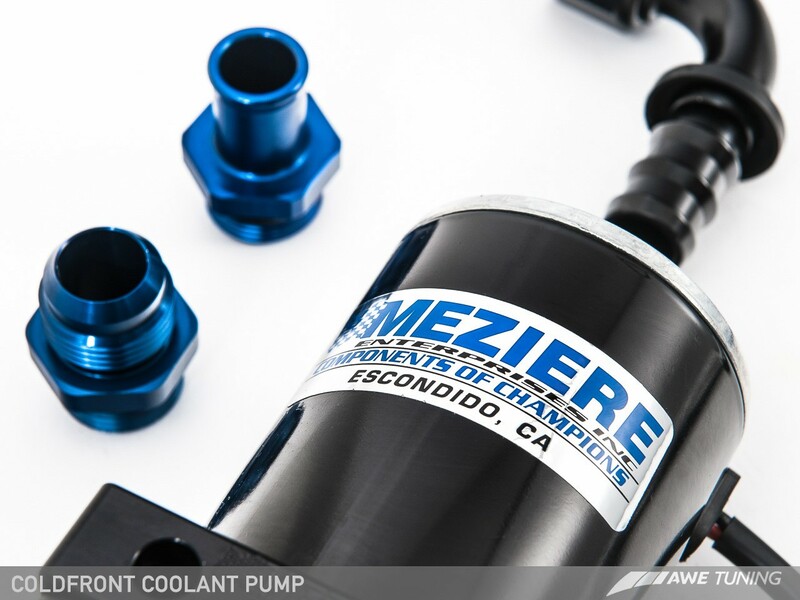 AWE's ColdFront™ Coolant Pump, manufactured by the cooling-system gurus at Meziere, is a bolt-on replacement for the stock heat exchanger coolant pump. It flows 100% better than the stock coolant pump. And since it flows better, that means the system is more effective at cooling itself, which means you will enjoy consistent horsepower. Fact. So they decided to come out with this AWE Tuning Audi 3.0T ColdFront System. 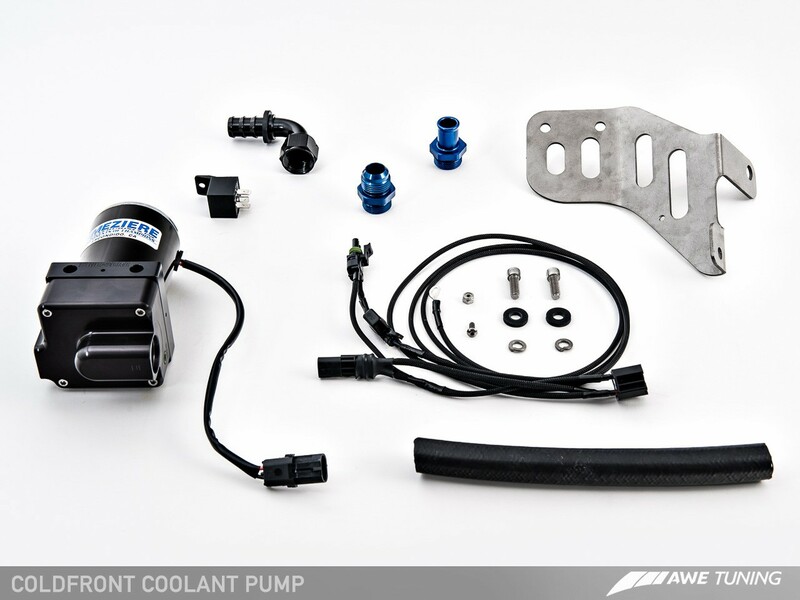 Completely designed and manufactured in house at AWE Tuning, the ColdFront System is the solution for consistent and reliable performance for modified vehicles looking for maximum power and reliability. 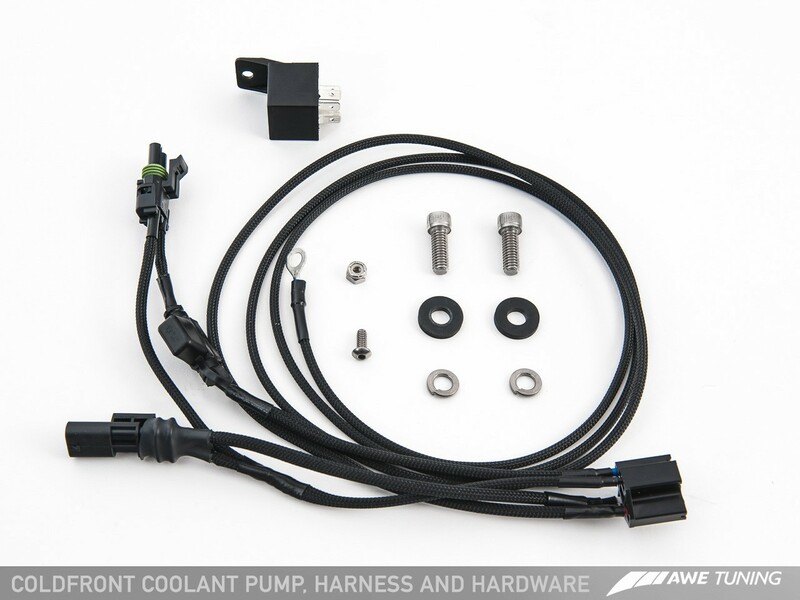 Optional ColdFront Coolant Pump Prevents -23HP LOSS from heat build up of multiple WOT runs. Air that isn't cooled entering your vehicle’s engine will rob power and performance. Modified vehicles, like those flashed and/or equipped with a modified supercharger pulley like the AWE Tuning Stage 2 Performance Pulley, are particularly susceptible to higher intake air temperatures. Installing the AWE Tuning ColdFront Heat Exchanger is proven to maintain consistent intake air temperatures and power, even under the most demanding of conditions. The AWE Tuning ColdFront Heat Exchanger utilizes a larger frontal area, resulting in in cooler supercharger coolant temperatures, leading to better air intake temperatures and consistent, reliable power. The AWE Tuning ColdFront Heat Exchanger was developed to reduce high air intake temperatures found in supercharged engines. Designed and conceptualized in house at AWE Tuning, this should be a mandate for supercharged 3.0T engines looking to keep things consistent and reliable. The AWE Tuning ColdFront Heat Exchanger is a direct replacement for the factory heat exchanger, fitting neatly behind the front bumper and grill assemblies. This system was specifically designed by the Engineers at AWE Tuning to include a drain plug and bleed screw, allowing the system to be bled without the need for external tools. In other words, all the benefits of a cooling upgrade with none of the fitment downsides. The AWE Tuning ColdFront Reservoir is CNC Machined from 6061 Billet Aluminum and plumbed directly into the heat exchanger coolant system to increase supercharger coolant capacity. The increase in coolant capacity leads to lower coolant temperatures, in turn supporting lower air intake temperatures. To further reduce coolant temperatures, the AWE Tuning ColdFront Reservoir incorporates a true flow through design which acts to reduce coolant temperature as it flows through the unit. The AWE Tuning ColdFront Reservoir features an anodized aluminum cap laser etched with the AWE Tuning logo, ensuring that checking the coolant level is a breeze. The AWE Tuning ColdFront Reservoir can be used either in combination with the AWE Tuning ColdFront Heat Exchanger to complete the ColdFront System, or can be used with the factory heat exchanger. The AWE Tuning ColdFront Protection Screen is the solution for guarding the ColdFront Heat Exchanger from road debris. The Protection Screen guards the full face of the heat exchanger with durable stainless wire mesh and is surrounded by a stainless steel frame, protecting it against any small objects that may find their way past the vehicle’s grill. This keeps the heat exchanger fins free of damage, allowing them to perform with maximum efficiency. Below are graphs of the performance testing done on the ColdFront System. All tests were performed on the AWE Tuning Mustang MD-500-SE AWD dyno using a 6-speed B8 Audi S4 equipped with G.I.A.C. Stage 2 Performance Pulley Software on 93 octane pump gas in a controlled ambient temperature of 90F. Above is a graph showing the supercharger coolant temperature difference of the coolant before entering vs. after exiting the ColdFront Heat Exchanger. The red line represents the pre heat exchanger coolant temperature. The green line represents the post heat exchanger coolant temperature. The top graph shows the temperature difference the stock heat exchanger is capable of producing, the middle graph shows the temperature difference the ColdFront Heat Exchanger is capable of producing, and the third graphs show the temperature difference the full ColdFront System is capable of producing. It can be seen that the stock heat exchanger struggles to keep the supercharger coolant temperatures low, especially at high RPM, yielding a maximum temperature drop of 8.6F @ 4760 RPM. In contrast, the ColdFront Heat Exchanger produced a maximum temperature drop of 13.7F @ 6960 RPM, and 14.5F @ 7100 RPM when adding the ColdFront Reservoir to complete the ColdFront System. This results in a total maximum temperature drop of 24F when compared to the stock unit. It can be seen that the stock unit suffers greatly from heat soak. During the eighth pull the intake air temperatures had climbed upward of 180F at redline. In contrast, the larger ColdFront Heat Exchanger produces a maximum air intake temperature of slightly over 165F after eight pulls. Adding the optional reservoir to complete the ColdFront System results in a maximum air intake temperature of just under 165F after the eighth pull, with lower temperatures throughout the first seven pulls as well. Above is a graph representing the horsepower produced when performing back to back pulls on our Mustang dyno (Four runs in total). The green green line represents the wheel horsepower during the first dyno run. The red line represents the wheel horsepower during the fourth dyno run. It can be seen that the stock heat exchanger suffered from heat soak, resulting in a power loss of 12 WHP @ 6900 RPM. In comparison, the ColdFront Heat Exchanger had a power loss of just 4 WHP @6900 RPM. When adding the optional AWE Tuning coolant reservoir to complete the ColdFront System, there was no power loss at all even multiple back to back dyno pulls.